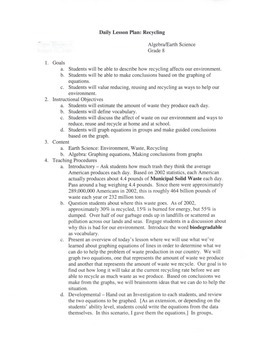 This lesson applies algebra: graphing lines, systems of equations to a real-world scenario of waste production and recycling rates in the United States. 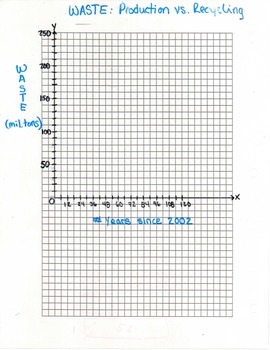 This lesson combines a real-world issue with critical thinking and application of algebraic graphing. It ends with students brainstorming how they can make a difference now by reducing, reusing and recycling. This file contains the detailed lesson plans, investigation worksheet to be completed in groups and a template plane for graphing (I used as an overhead).